Mon., July 30, 2018, 4:52 p.m. The Spokane Indians (4-2) face the Hillsboro Hops (4-2) in the fourth of a five-game Northwest League series at Avista Stadium at 6:30 p.m. The Indians send RHP Tai Tiedemann (1-2, 4.73) against the Hops’ Jackson Goddard (0-2, 7.88). Tiedemann has thrown 5.1 innings in each of his past two starts. The 2016 eighth rounder gave up a season-high five earned runs in his most recent game against Tri-City. Goddard hasn’t pitched more than two innings in any of his six starts this season. In his last outing, against Boise, he didn’t allow a hit in his two frames but the 2018 third-round pick of the Diamondbacks has allowed at least one run in four of his five starts. Lineup: 1) LF Jonah McReynolds, 2) CF J.P. Martinez, 3) 1B Curtis Terry, 4) 3B Diosbel Arias, 5) SS Jax Biggers, 6) C Francisco Ventura, 7) DH Troy Dixon, 8) 2B Cristian Inoa, 9) LF Hasuan Viera. Player to watch: Francisco Ventura. The catcher has been a run-producing machine lately with five home runs in his last 11 games. He’s also driven in at least one run n eight of the last 11 for 13 of his season’s 16 RBIs. Hillsboro top prospects: OF Jake McCarthy (No. 8, 39th overall pick, 2018 MLB Draft), OF Tra Holmes (No. 30, 11th round pick, 2017), C Andy Yerzy (2nd/2016), RHP Matt Tabor (3rd/2017), RHP Jackson Goddard (3rd/2018), RHP Ryan Weiss (4th, 2018), INF Joey Rose (5th/2016). 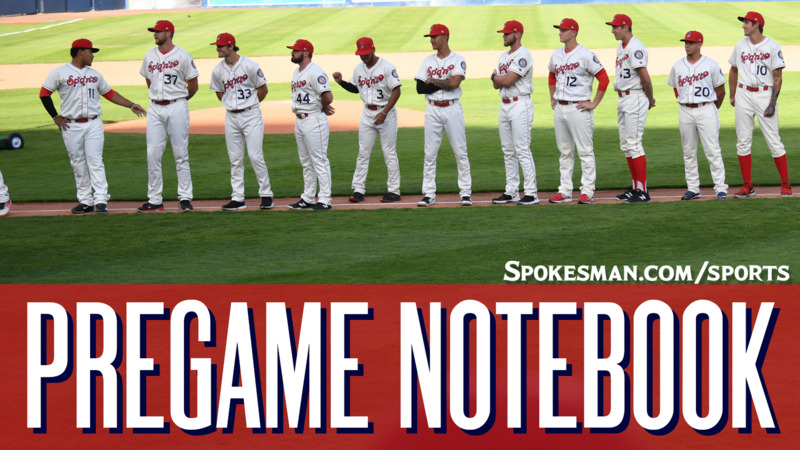 Last night: Jake Latz allowed five hits and one walk while striking out seven over six shutout innings and the Spokane Indians beat the Hillsboro Hops 2-0 at Avista Stadium on Sunday. The Indians (4-2) are tied with the Vancouver Canadians for the lead in the Northwest League North Division. Diosbel Arias went 2 for 4 with an RBI, a run and a double and Francisco Ventura added an RBI single. Reliever Cole Uvila provided 2.1 shutout, hitless innings – though he issued a pair of walks and hit a batter – and Emmanuel Clase faced one batter – a strikeout of Gorman with two on in the ninth – to earn his league-leading seventh save. Promotion: First Responders Appreciation – The Indians thank the First Responders of the Inland Northwest. Local first responders will be on-hand to do demonstrations and show off their equipment. After the game, kids circle the bases. Weather: Game time – Partly sunny, 96. Final out – Clear, 79. Published: July 30, 2018, 4:52 p.m.